Specific technical solutions together with the program of professional care will ensure the smooth operation of your devices. Our philosophy is not just to sell many inverters; our philosophy is to do challenging engineering projects with own products. VONSCH develops and produces frequency converters for induction and synchronous motors in power range from 0.37 kW up to 1400 kW. For more information, please see our electric drives solutions. Device based on VONSCH frequency converter, providing "pure" sine wave voltage and current of the required frequency made for testing the equipment designed for use on non-standard electrical networks other than 50 Hz, for example: 60 Hz, 400 Hz. Our mission is to contributie with our research, development and production to the ecological and cheaper methods of electricity production and optimal energy mix. Although the "green" solutions might seem expensive at first sight, the investment in the future is certainly worth of it. VONSCH offers single-phase and three-phase solutions for photovoltaic applications. For more information, please see our Photovoltaic solutions. The use of wind as an energy source in recent decades experienced a turbulent development, from very amateurish applications to hundreds or even thousands of MW installed in recent years. Slovakia is not ideal in terms of wind energy conditions; despite the use of wind energy has some potential for us - as evidenced by the operation of several wind farms. 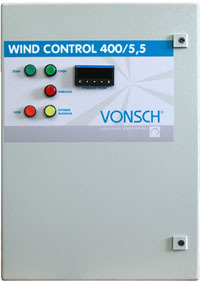 For wind turbines VONSCH offers a device called WIND CONTROL 400, whose principle of operation is similar to MVE CONTROL . It adjusts the propeller speed independently and automatically, on the principle of maximizing the energy produced. Benefits resulting from the use are similar to those of MVE CONTROL . WIND CONTROL is available in custom enclosure versions - the basic enclosure can contain other electrical equipment associated with operation of the plant. Power of the generators can be up to 1.4 MW and a standard induction motor can be used as generator. WIND CONTROL can be used to for off-grid power, but in these types of power plants the accumulation of energy needed to start the system and for excitation of the generator or a self-exciting generator must be used. For small hydro power plants (SHPP, MVE is a slovak version of acronym) a device called MVE CONTROL is offered. MVE CONTROL is essentially unique power electronics device that operates on the principle of two inverters. One inverter addresses the speed control of water wheel motor (or turbine) to maximize the power, the other inverter (actively controlled rectifier) supplies the generated power directly to the grid. We work with designers and manufacturers of small hydro power plants or we deploy MVE CONTROL to already existing plants - where we know it will be useful and effective. For horizontal wheels directly placed in the river, the production of energy without devices like MVE CONTROL is impossible. For example, speed of the water in Danube varies from 1.5 to 2.5 m/s, so this ratio must be adjusted to the orbital speed of a water wheel - generator. 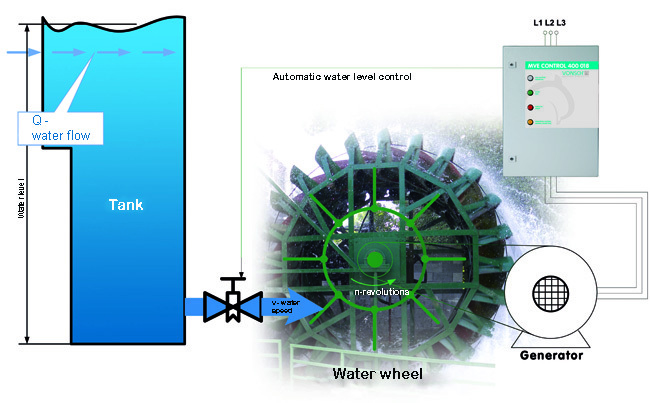 Excellent results were obtained when MVE CONTROL was used with vertical water wheel motors, which controlled the wheel speed (generator) to operate the plant even at low flow rates and water speeds, when the classical solutions with a generator connected directly to the grid cannot be used. 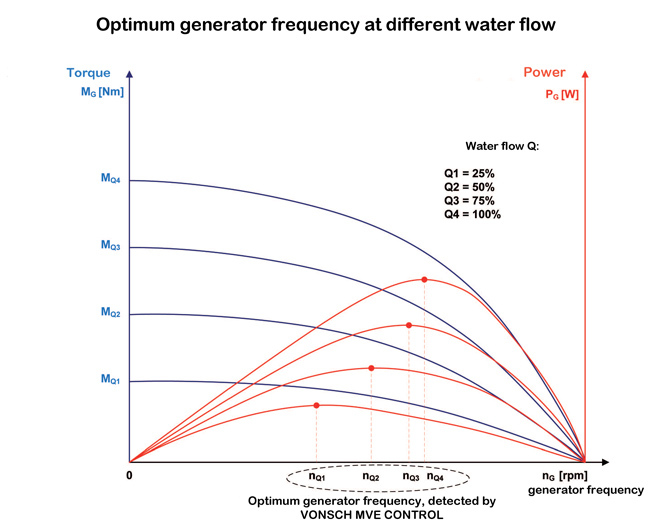 All these adaptations by MVE CONTROL are performed by maximization of power - it automatically adjusts speed of the generator to the speed and "energy" of water and thus it maximizes the power of MVE CONTROL . Supply of electricity to the grid is achieved by the control of the regenerative inverter, which also includes a network of independent circuits for the work of protections (current, voltage and frequency). Above the threshold values of output current, frequency and power parameters of the grid, MVE CONTROL is disconnected from the grid by opening the input contactor device. MVE CONTROL produces only active power - power factor is equal to 1. MVE CONTROL is available in custom enclosure versions - the basic enclosure can contain other electrical equipment associated with operation of the plant. Power of the generators can be up to 1.4 MW and a standard induction motor can be used as generator. MVE CONTROL can be used to for off-grid power, but in these types of power plants the accumulation of energy needed to start the system and for excitation of the generator or a self-exciting generator must be used. Our philosophy is not just to sell many inverters; our philosophy is to do challenging engineering projects with our electric drives. Our purpose is to create individual solutions for each customer. Why cooperate with VONSCH specialists? VONSCH has rich experiences in the area of traction inverter solutions, especially in the area of control of induction and synchronous motors. Traction inverters technical solution comes out from our hiigh-performance vector control. As the power supply, accumulator batteries or trolley lines are used. VONSCH in addition to a broad portfolio of its own products also provides services for its products or the products of other manufacturers. VONSCH provides unrivaled professional comprehensive after-sales service for the entire range of our products. High-quality componentsof our products and 72 hours of testing of every product on the real load reduce the number of service calls to a minimum. The warranty period for each product are longer than defined by the law (25 months) and ordering preventive examinations or signing a service contract or program of comprehensive care, the warranty period is adequately extended. Our goal is the satisfied customer. Nonstop number +421 905 253 188 - useful technical advice and prompt service is provided 24 hours a day. Warranty repair is done either by the services agreement (where the repair can be arranged within 24 hours or as soon as possible), in agreement with the customer. Usually up to 3 days. Service by VONSCH is not only about 'traditional' arrival to the customer, which says nothing about the repairs, but full elimination of defects, since the service department has specialists that are equipped with all the spare parts and the know how. Warranty repair method is described in the documentation of products - lower power products should be delivered to VONSCH site, products of higher power will be repaired by our technician at customers site. Post warranty service is just as fast, high quality and available as the warranty service. Several options are offered to the customer and free of charge advice is still provided, because the initial cause of the failure is very often in the connected devices or machines, and not in the product, which only indicates the error. Preventive examinations and prophylactic service is done in agreement with the customer on the basis of a service contract or a contract for preventive inspections at agreed intervals. In agreement with the client we offer training service for our devices, but we are able to train your personnel in a broader context. We know that our service is our strength and we are proud of it. We can remotely configure and diagnose all our devices using TeamViewer. All you need to do it is a computer, A/B type USB cable and internet connection.You can download TeamViewer at TeamViewer.com or use our modified QuickSupport Module for even easier VONSCH remote support. The professional care about electric drives program is a service of complete maintaining and servicing of all brands of electric drives by VONSCH, in companies not engaged in electric drives, but where the drives are one of the tools for achieving strategic goals. Our experts provide inspection of the drives and prepare complete plan of care and determine the overall reliability of the system for every frequency converter. The output of the inspection is a document describing overall state of electric drives, including an overview of the drives and the grouping of the drives according the overall reliability. For these groups we prepare a timetable for next inspections and a list of recommended spare parts. Service history and records of inspection , together with measured data are stored and evaluated by our special database software. Projecting and realization of optimal technical solutions with electrical energy savings and compensation of harmonic distortion. We believe in our work and we are proud of it - we are looking forward to your challenges!